When I was sent Interplays ‘Design & Make Steampunk Jewellery’ kit I was a little unsure how it would go down in our house. I could go on and on. It’s a bit of a love hate thing. 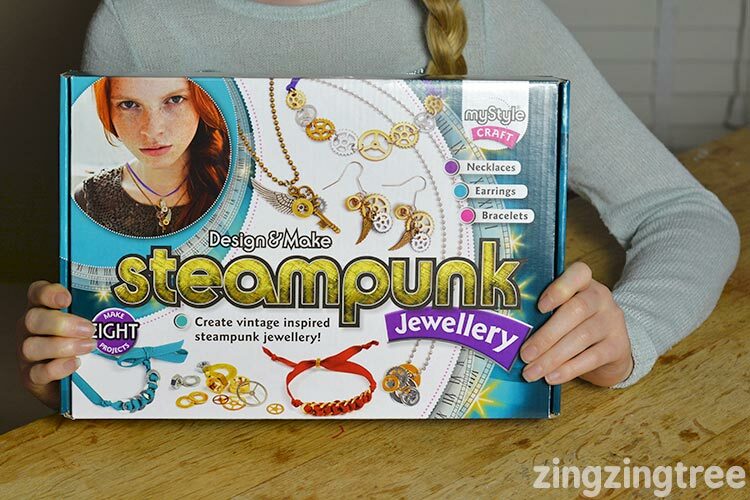 Anyway, the Steampunk Jewellery kit arrived and generated a great deal of excited oohing and ahhing from my girls. All good so far. Inside you get a small plastic container full of little metal cogs, nuts, washers, keys, jump rings, earing attachments, ribbon, fine coloured wire and chains. There’s even a cute child sized pair of flat nosed pliers (cue more ooh’s and ahh’s!) 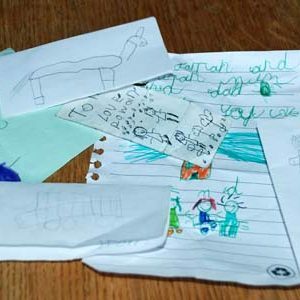 plus a tube of strong white glue and a great detailed, clearly illustrated instruction booklet with eight projects … more oohing and ahhing! 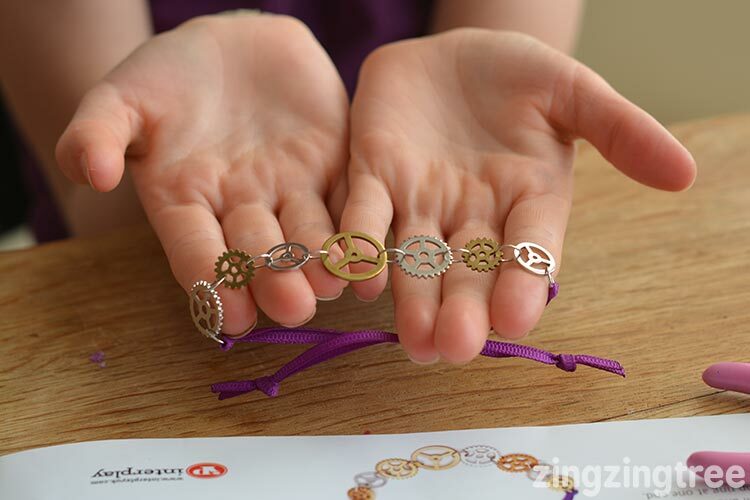 With projects chosen and pieces selected, my nine and ten year old girls happily sat around the table and created beautiful little pieces of vintage style steampunk jewellery with NO HELP required from me. The kit is for ages 8+ which I would say is about right. 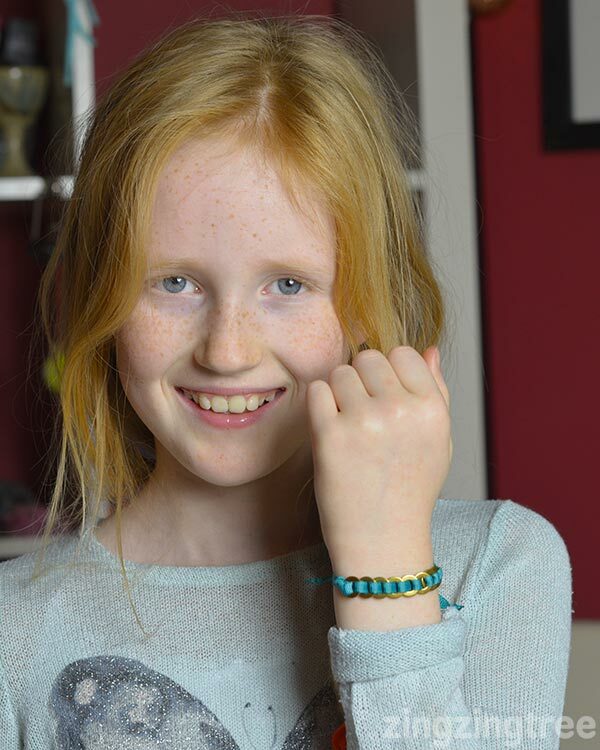 My girls would have been capable of making these at about 6 years old but I don’t think they would have looked after the finished pieces of jewellery carefully enough and the style would definitely have been to old for them. The girls absolutely loved this kit. All the projects are quite quick and easy to finish with the longest amount of time taken up waiting for the glue to dry. 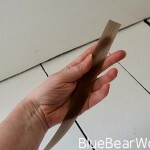 The individual little metal jewellery pieces are well made with no rough edges and the grosgrain ribbon is good quality. The instructions are clear, well illustrated and simple to follow. There are a couple of printing errors and some of the materials are a different colour but that doesn’t take away from the experience. My one top tip would be to apply the white PVA glue quite thickly so that the pieces stick together well. It looks a bit of a white mess initially but the glue dries clear so don’t be afraid of putting on too much. Another option is to use your own stronger adhesive. As a parent and crafter I really liked this kit. 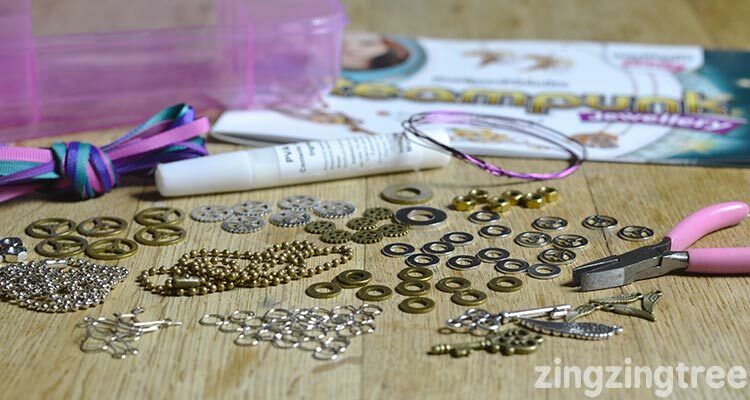 It gives good grounding and experience in some basic jewellery making techniques that can easily be applied to other projects. I like that the projects aren’t too complicated and use a small mix of materials to create a variety of finished work demonstrating that things don’t need to be complicated to be cool. 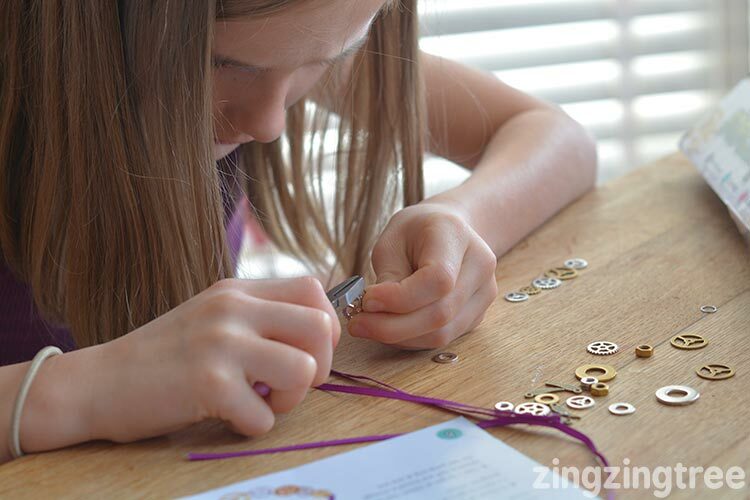 Interplay’s Design & Make Steampunk Jewellery kit is the kind of craft kit that gives kids a real sense of achievement at the end. 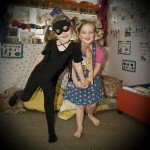 They learn, they laugh, they make and they get to wear something that looks like it might have bought in a shop. 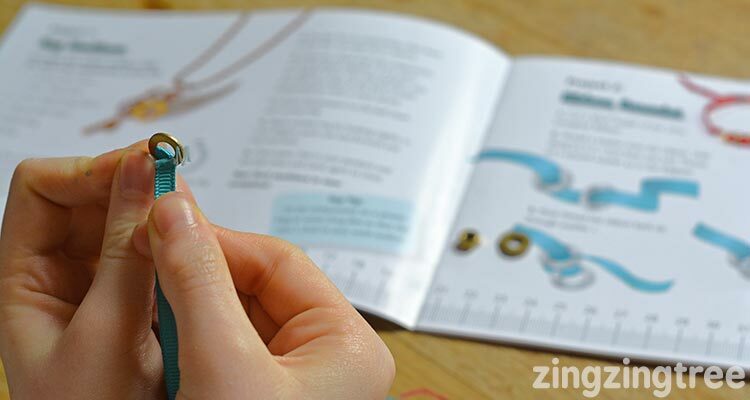 That’s a craft kit worth having. 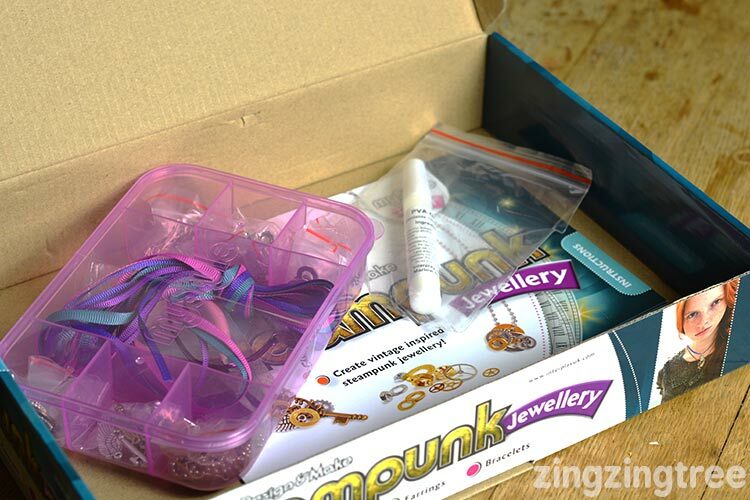 We were sent this craft kit to review by Interplay. All thoughts, copy and photographs are my own. This looks like just the sort of kit my daughter likes. A good one to remember for presents as well. This looks like a great kit – and the pieces that your girls made look very good. i understand you about craft kits, but I love the look of this one and I like that the girls could use it independently. This would be great for my nieces. This looks like a lot of fun. I have the same reservations as you about craft kits; sometimes they can be really hit and miss but this looks great. This looks and sounds like the perfect gift for two of my sisters! My daughter would love this, it looks fab quality also! I really don’t like flimsy products!